The defence of the accused is being used to stoke nationalist tensions in the run-up to the general election on April 9, and to shift Israeli politics further to the right. All the mainstream parties are complicit. The five boys, students at the Pri Ha’aretz yeshiva (religious seminary) in the Rehelim settlement in the occupied West Bank, are accused of the stone-throwing attack on a Palestinian car October 12 that killed Aisha Mohammed Rabi, 47, a mother of nine, and injured her husband, Yacoub. The past year saw a threefold increase in racist attacks on Palestinians over 2017, with 482 politically motivated crimes by Jews reported in the West Bank. These included beating and throwing stones at Palestinians, painting nationalist, anti-Arab or anti-Muslim slogans, damaging homes and cars, and cutting down trees belonging to Palestinian farmers. As is common in such stoning attacks, the police dragged their feet over their investigation, to the extent that few believed any action would be taken. According to the public broadcaster Kan, the day after the stoning attack, settlers from Yitzhar broke with the strict religious rule of not driving on the Sabbath and traveled to the Rehelim yeshiva. One of those in the car was reportedly Meir Ettinger, a grandson of the extremist Rabbi Meir Kahane, whom the Shin Bet, Israel’s domestic intelligence agency, has accused of being a ringleader of an underground group that spawned the racist filth legitimising attacks on Palestinians. In 2015, Ettinger spent time in administrative detention, which enables the state to order someone’s arrest without informing the detainee of the reason or providing any evidence of wrongdoing, and to detain him for unspecified periods and interrogate him without lawyers in attendance. Administrative detention orders are routinely used against Palestinians, but rarely against Jewish Israelis. Ettinger’s arrest followed attacks on Palestinians in the West Bank and churches and mosques in Israel by right-wing Jewish extremists, including the torching of a Palestinian family in the West Bank village of Duma, which killed an 18-month-old baby. The use of administrative detention orders under the pretext of combating militant Jewish nationalists facilitated the introduction of such methods as part of the build-up of repressive measures to be used against the working class. On October 13, Ettinger and his companions went to the Rehelim yeshiva to brief the assailants before any investigation, arrest or interrogation, and thereby prevent them revealing the details of the stoning attack. Two weeks ago, Shin Bet, not the police, arrested three of the suspects on suspicion of murder. They also arrested two others who were taking part in a protest in support of the alleged assailants. A gag order was imposed on the media to prevent any reporting on the details of the investigation, and the youths were banned from seeing their lawyers, the far right activist Itamar Ben Gvir and Nati Rom and Adi Kedar of the Honenu NGO, which provides legal aid to Jewish activists suspected of terrorist attacks. The police also called all the yeshiva students in for questioning after entering the seminary amid claims from the staff that they did not have a search warrant. By last Thursday, 30 students had been questioned. 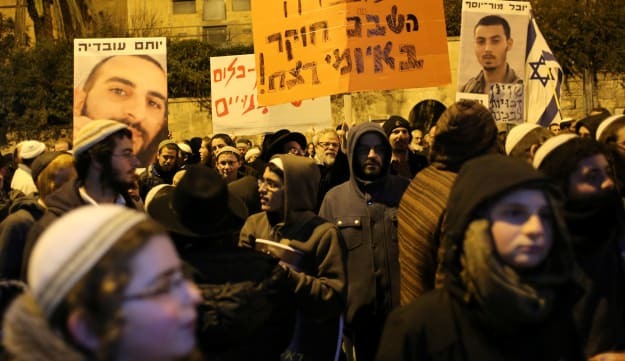 The settlers and their supporters, including religious leaders and the suspects’ lawyers, issued statements condemning the arrests and organizing protests outside the homes of Prime Minister Benjamin Netanyahu and other cabinet members, and later demonstrations outside the court proceedings. Neither Netanyahu nor any member of his cabinet had condemned the attack or demanded that those responsible be brought to justice. Rather, they actively encouraged the protests over the arrests and the investigation. On Thursday, a judge ruled that four of the suspects should be released and subject to house arrest, while the fifth should be kept in detention because of the nature of the allegations, the evidence against him and concerns over obstruction of justice. Such obnoxious and abhorrent phenomena mirror similar trends internationally and demonstrate the bankruptcy and reactionary dead-end of the entire Zionist project.